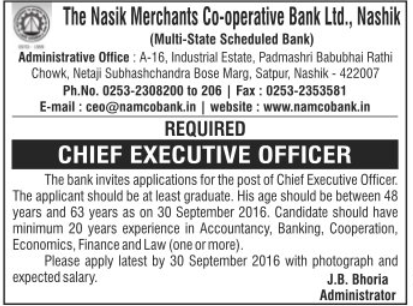 The Nasik Merchants Co-operative Bank Limited (NAMCO Bank), Nashik invites applications for the post of Chief Executive Officer (CEO). The last date for submission of applications is 30th September 2016. Eligibility: Candidate should have minimum 20 years experience in Accountancy, Banking, Cooperation, Economics. Finance and Law (one or more). Eligible Persons apply latest by 30/09/2016 with photograph and expected salary.